If you are like me and work from home full time, I’m sure you’re tired of the people who say, “Oh, you’re so lucky!” because you know what they’re ACTUALLY thinking: “I bet you sit on the couch in your PJs watching movies all day and get paid for it.” As if. 1 ) CLAIM YOUR SPACE – If working from home is your full-time gig, then a seat at the kitchen table with your laptop and notebook just won’t do. 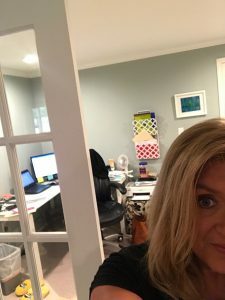 It’s so important to have space designated for your office — somewhere that is off-limits to the rest of your family, and also off-limits to you during much important down time. And make it a place you love. 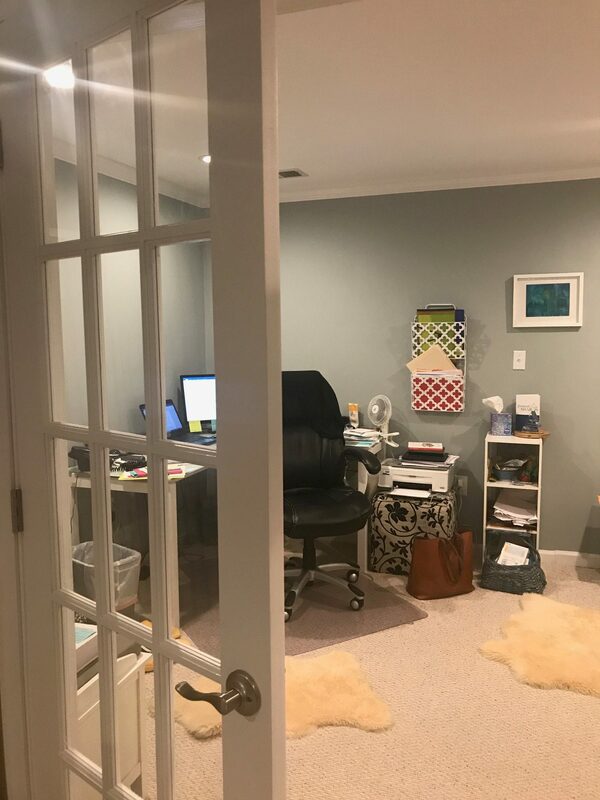 There are tons of images online of creative home office spaces (in closets, under stairs, divided rooms, etc.) that are both functional and beautiful. When you step into your office, there should be a distinctive shift in your mind set: You are no longer home; you’re at work. 2) Establish Rules for Others – To go hand-in-hand with the person who thinks you’re lounging all day and getting paid for it are the family members and friends, some who live with you and some who don’t, who will think nothing of interrupting your day because, well, they know you’re home. I’ve had my share of interruptions — I once had an au pair present me with a 2-year-old covered in vomit while I was in the midst of running a multi-person conference call – so I speak from experience. While they don’t always abide by the rules, I’ve laid them out very clearly. When my door is closed and I’m turned away, don’t interrupt. If I don’t answer a text, then it must mean I’m busy and won’t be receptive to multiple follow-up texts. I will ONLY answer the house phone while I’m working if it’s the school calling. If I’m on the phone, don’t even think about bothering me. You get the gist. These rules will vary by person, of course, but you need to set limits. In the process, you’ll be teaching your kids (and others in your world!) how to solve some problems on their own, and that’s not a bad thing! 3) Establish Rules for Yourself – Self-discipline is the key to being successful at working from home full time. Which is why it’s not for everyone. If you’ve never done it before and are considering it, do some serious soul searching before you make the decision. It’s not always easy to keep yourself on track! I know, for myself, I must shower, dress and put on makeup every work day, even if I’m not going to see anyone but my husband and kids all day. It just puts me in the proper, professional mind set. I also know that I can get lost in a project and spend far longer in my office than I should, missing dinner with my kids, etc. So I know I have to leave my desk at a certain time each night, and if there’s more work to finish, I’ll take care of it after the kids are asleep. 4) Don’t be a hermit! — One of the worst parts of working from home is not benefitting from the energy and inspiration that can come from interacting with colleagues and other professionals on a daily basis. It is easy to start feeling isolated if you don’t make an effort to create these interactions for yourself. There are multiple ways to achieve this. I found that I was meeting a lot of other folks who work from home, too, so I’ve created a loose network of people to meet for lunch every few weeks or so. I also take advantage of my lunch hour to run errands, etc., which sounds mundane, but, when your home is also your office, you need to leave it from time to time during the day to keep your head clear. Even if it’s just for a walk around the block. Do you have any more good tips? I’d love to hear them, so please comment below! And stay tuned for part two; my next blog will be about how to stay fully integrated with the main office when you aren’t there every day. Excellent post. Very helpful for me as I begin working from home with a new company, in a new city!